Bonjour mes amis! Just practicing my French, in case I have to bust it out while volunteering at the Games in February. Hope you all had a wonderful Wednesday. I started my day off with a quick breakfast, per usual for my early 5:30 am wake up calls. 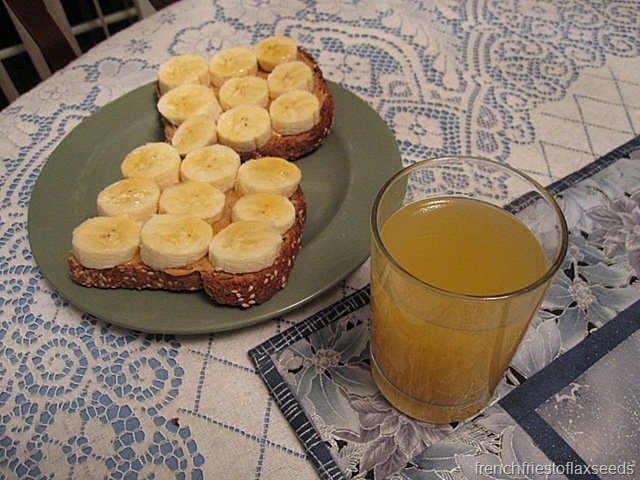 PB & B on toast. 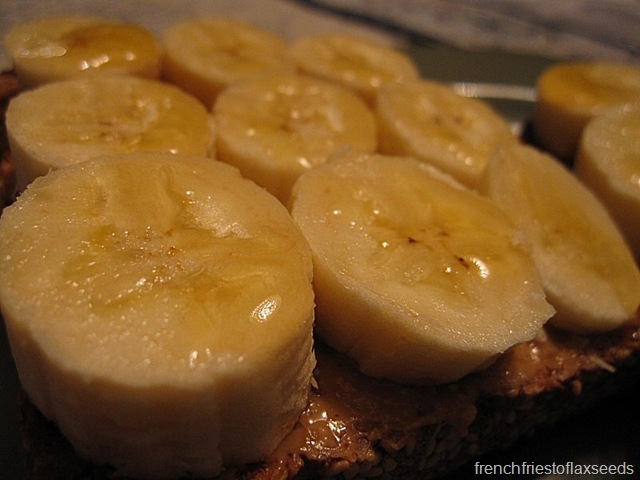 I toasted up two slices of Silver Hills Squirrelly sprouted grain bread, spread on some creamy peanut butter, and topped it with ripe banana slices and a drizzle of agave. With the standard glass of juice – Happy Planet Mango Peach Party. 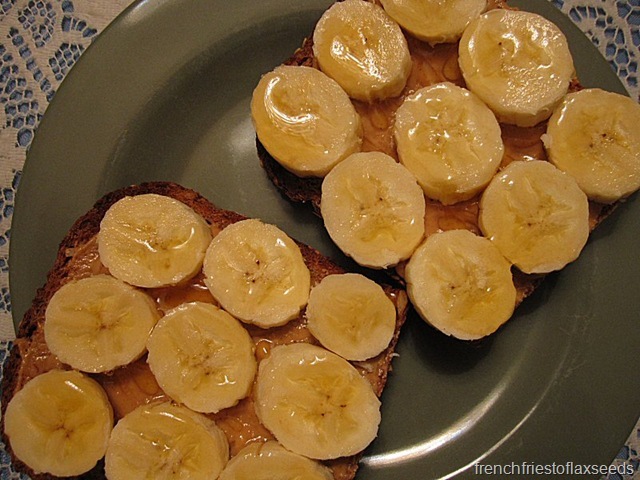 As long as there is peanut butter involved, I’ll eat bananas. What can I say, I’m particular like that with my eats. Transit was busy this morning, so I ended up standing on both the train and bus, which is always a fun challenge – the bus I take is an express bus, and sometimes I wonder about the drivers. I managed to survive though, and made it though my biochemistry lecture without falling asleep as well. 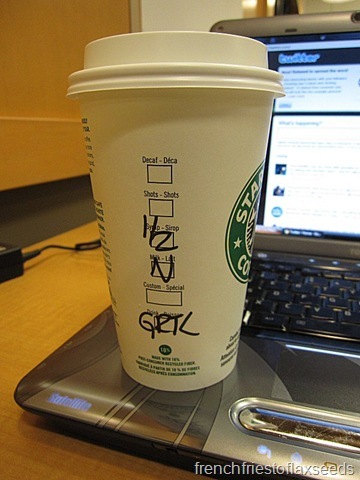 It was fu-reezing today, and I had to break down and get a little something something from Starbucks. The usual non-fat, half sweet green tea latte. I did notice though, that they offer a vanilla rooibos latte that I’m pretty sure I need to try out. There could possibly be competition for my beloved green tea! It did a good job of getting me all warm & toasty, while I wasted time during my 3 hour break in my usual hideout. 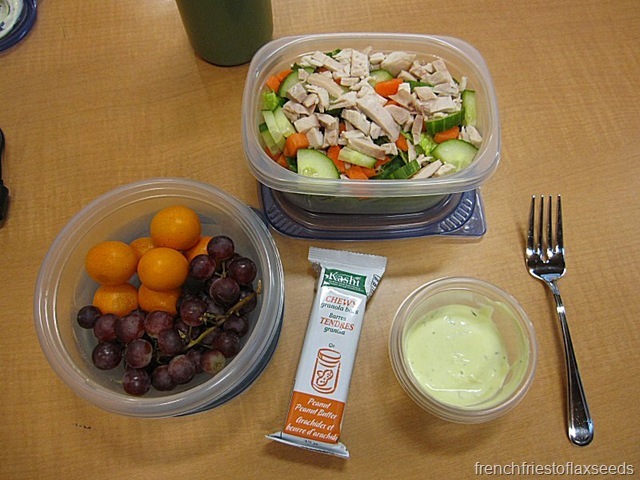 Eventually my tummy was a’ grumbling for some lunch. 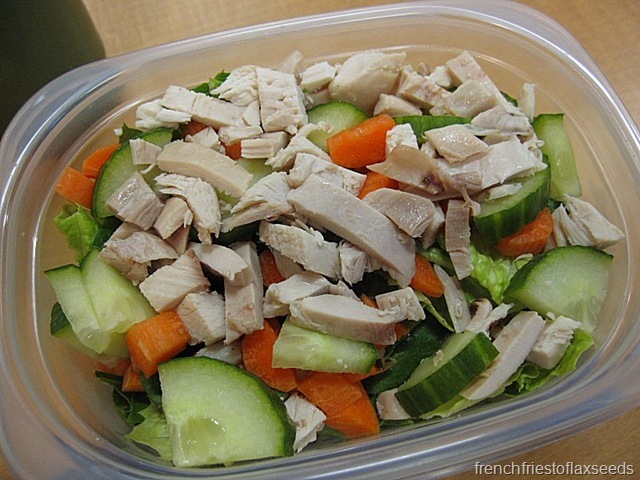 I had a salad – romaine lettuce, cucumber, carrot, roasted chicken, dill dip for dressing. 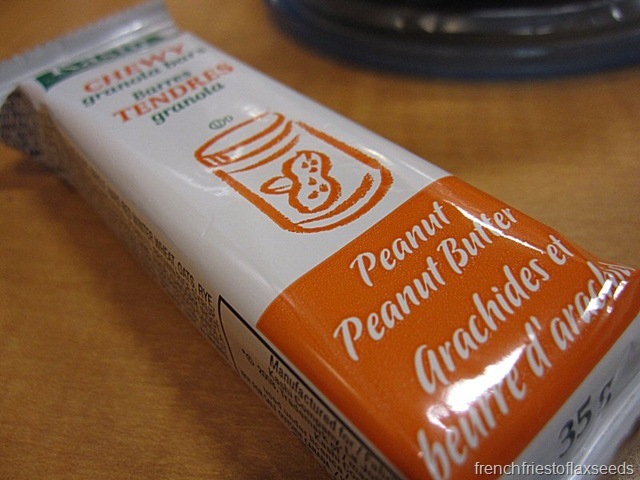 A Kashi Peanut Peanut Butter granola bar. 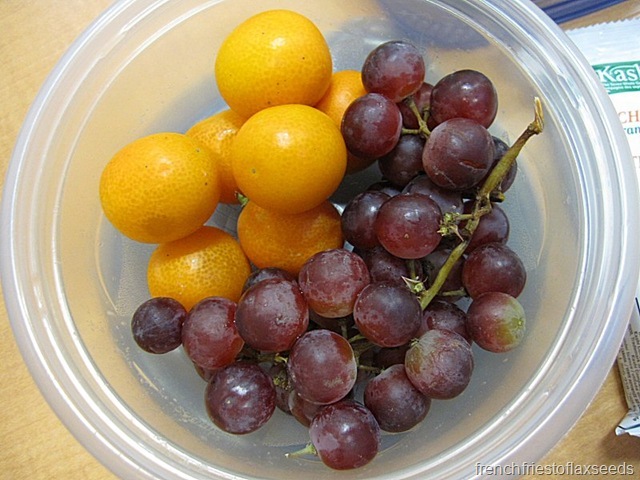 And some fruit – red grapes and kumquats! We had kumquats on sale at work last week, and I was intrigued since I’d never had them, and the fact that you eat the whole thing, peel and all. So the salad disappeared, as did the granola bar. I think I ate maybe 5 grapes and a kumquat, and I was done with fruit. I don’t know if it was just because I was full, or I wasn’t feeling fruit, but I packed it up and brought it home. 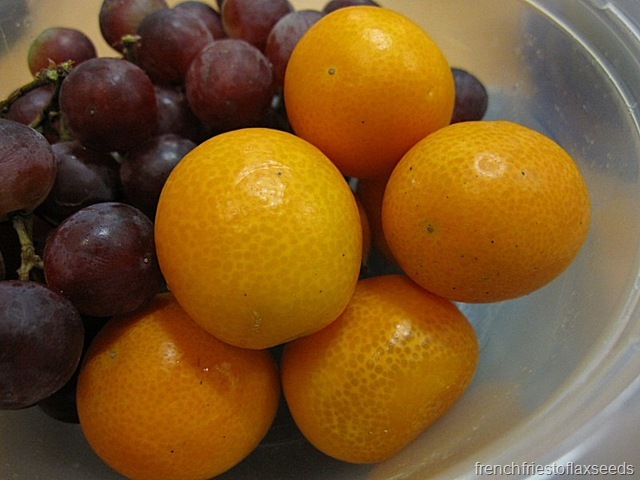 And if you are wondering about my thoughts on the kumquat – I like them! I don’t eat alot of citrus fruit because I loathe the pith. I cannot eat any of it – it makes me gag. So as you can imagine, if I wanted to eat an orange, it would take me forever. I’m not willing to put in that much work just to eat an orange. But kumquats? You just pop the whole thing in your mouth. They are a little sour, but I like sour. 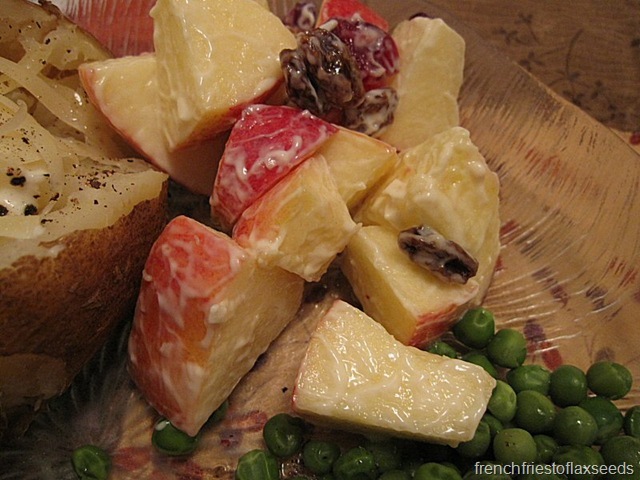 A fun little fruit – you should try them out if you can. 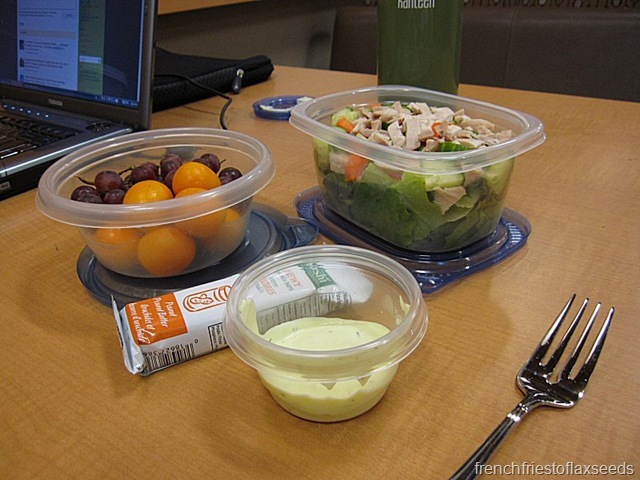 While enjoying my lunch I received a call on my cell – work wanted me to come in for 4 hours. I guess someone called in sick, and since they messed up my schedule this week (only 1 shift), I was the obvious person to call. I knew I would be tired when I got home, but figured 4 hours (and the cash earned) wouldn’t kill me, so I agreed. Food science was as exciting as ever, as was my transit ride home. 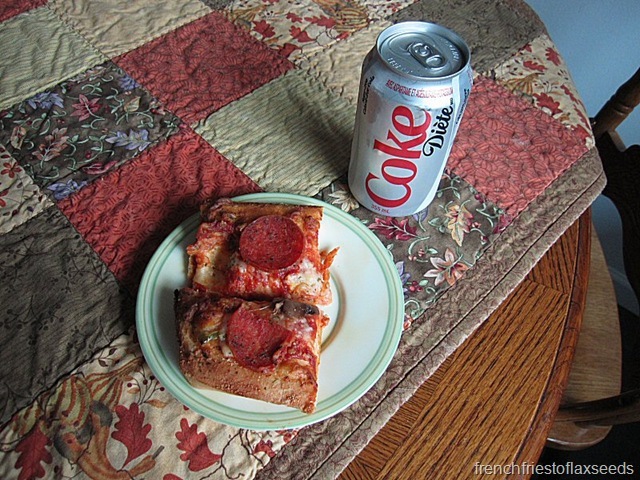 When I walked in the door, I was hankering for a snack. Work was sloooooooow. That’s all I have to say about that. Although, speaking of work – remember the interview I had on Sunday at Thrifty Foods? Well, I know they contacted at least one of my references (family friend – she called my mom to tell her about it). From what she said, they were impressed with my interview. So keep your fingers crossed – I should know by the end of the week! 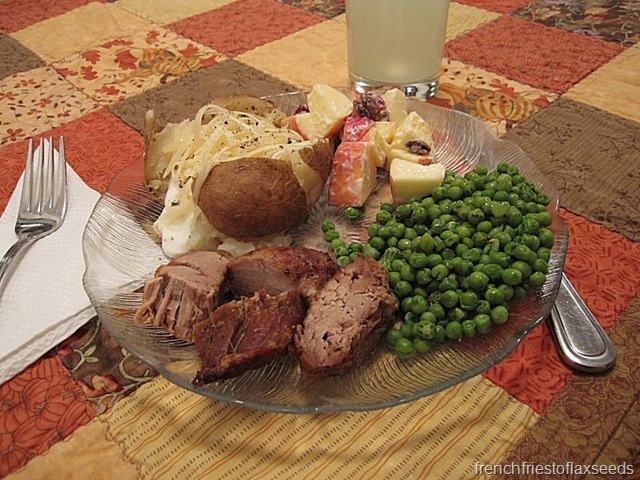 Anyways, I made my way home, and of course, dinner was ready and waiting for me. Thanks mom! 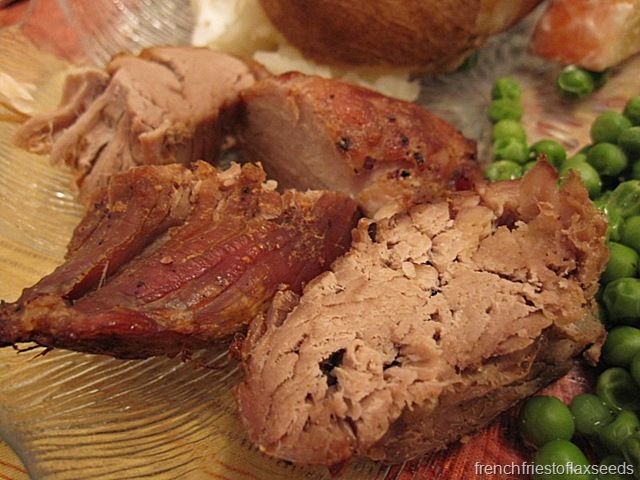 A little roasted pork tenderloin. 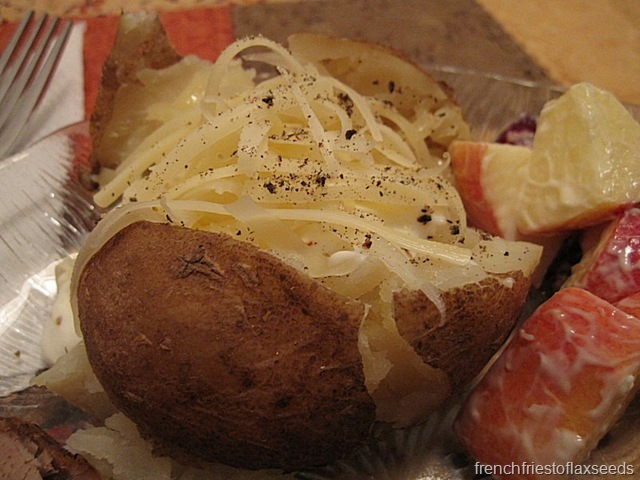 Baked potato, which I topped with all sorts of good stuff – sour cream, swiss cheese, garlic powder, black pepper, and a touch o’ butter. A spoonful of apple/craisin/raisin salad. 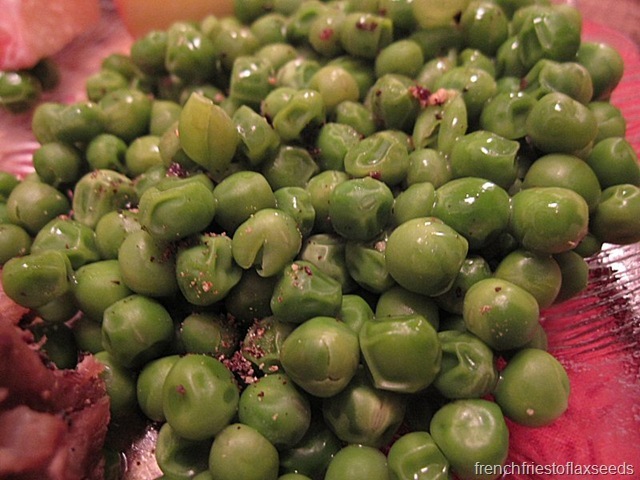 And a pile of green peas. 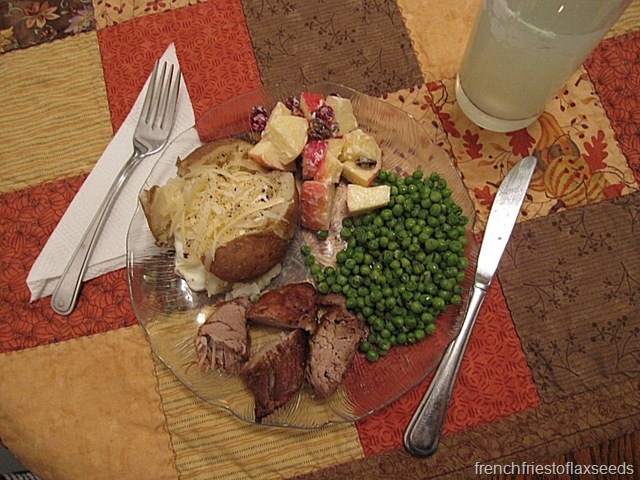 Who doesn’t like coming home to dinner? That about sums up my day. I really should have gotten started on some biochemistry studying, but who wants to do that at 9:30 pm? There’s always tomorrow. Which is coming soon, so I’m off to bed. Night! PS – Wanna win some Olympic Red Mittens? Click here. The vanilla rooibos lattes are really good. I always forget about them, though! BTW…my hubby saw the photo of you in your Olympic gear and figures that he can indeed fit into one of the pockets!! 😉 LOL!! French is the most beautiful language! Can you type it sometimes, just so I can “hear” it! That din looks great. I’m likin whatchya did there to that tater! Congrats on the reference call! 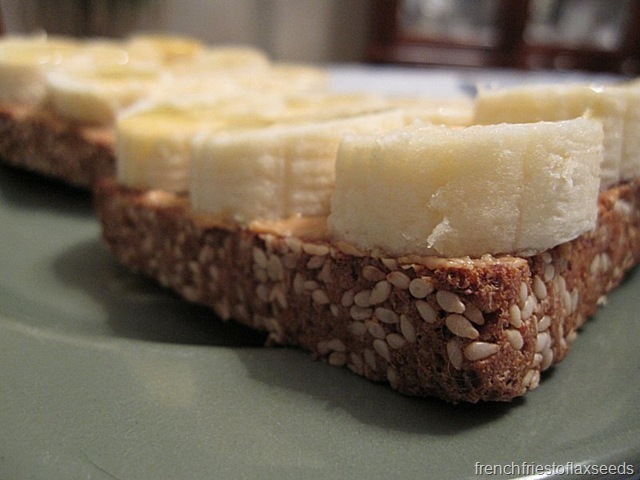 Those are always good to get..
Have you tried the Squirrely flax bread? Pretty delish! That’s awesome about your interview…still keep my fingers crossed for ya!